North Metro Atlanta businesses and homeowners now have an unprecedented way to deep clean buildings and homes without the potential damage associated with pressure washing. The family-owned business takes roof and exterior cleaning to another level, using an exclusive patented low-pressure cleaning solution. Their roof cleaning solution is preferred by the Asphalt Roofing Manufacturers Association (ARMA). Here in the South, most of the discoloration and build up that develops on roofs and exterior surfaces comes from organisms such as algae, mold, and mildew, and lichen— all living, organic bacteria. MagicClean SoftWash uses science instead of destructive pressure to give you a 99.9% kill ratio on the mold, mildew, and bacteria damaging your roof and other exterior surfaces, like roofs, siding decks, patios and fences. This is achieved with the use of SoftWash System'sTM highly effective 100% biodegradable, non-hazardous chemical cleaning system. The softwashing process targets multiple surfaces, kills organisms and inhibits their return, while sanitizing every surface being treated. The all in one process does so without damage to the target area or the surrounding vegetation. The softwashing process is so effective that it's cleaning, sanitizing and buffering lasts up to 6x longer than power washing. This makes MagicClean the only environmentally and financially sustainable choice for all your exterior needs. MagicClean SoftWash is your best and safest solution for a broad range of services for exterior and roof cleaning in Atlanta, providing superior cleaning treatments for your home or business. Our trained, fully insured, professional service technicians will honor time commitments, while arriving in our branded, company trucks with the right tools to restore your home and business back to its original beauty. Unlike the other guys, every MagicClean SoftWash professional is background-checked, fully insured and fully capable of exceeding your expectations…our goal with each and every valued customer. When you require professional roof and exterior cleaning services, you can trust and depend on us to do the job right. 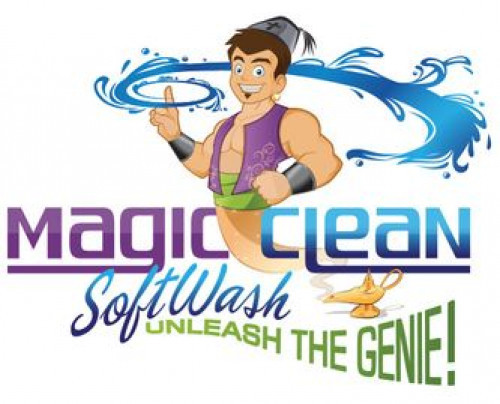 Unleash the Genie, and experience clean like never before! Restore your property to it's original, pristine and sparkling condition, restoring real property value while killing and eradicating the gunch. Call us today and schedule your appointment!